The breakdown of viewing data into regional areas is important for broadcasters and advertisers. Many advertising spots are traded not only on a national Network basis, but also on combinations of regional areas called macro regions. There is therefore a single Network panel from which regional data for 13 regional panels are produced. These regional panels are non-overlapping geographical areas based on the ITV1 Sky Digital reception regions. Regional viewing is also available for 14 BBC regions. Viewing that takes place in a particular region is reported as viewing from that region, even if the broadcast actually originated from another regional area. Under this system, all regional viewing, whether to broadcasts originating in the home region or from outside it, is captured and reported. For advertisers, this delivers a true reflection of the number of viewings of each commercial – the total number of impacts it achieved – across the Network, macro regions and individual regional areas. 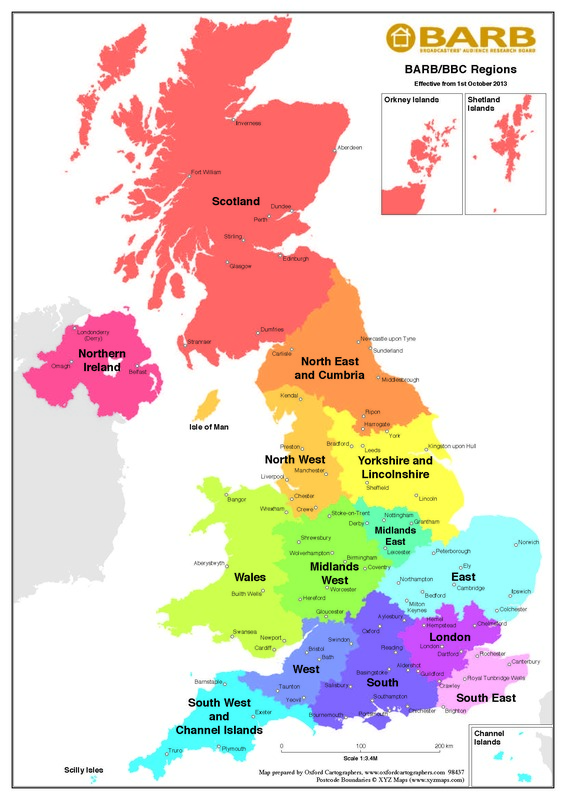 Regional viewing is also available for 14 BBC regions.